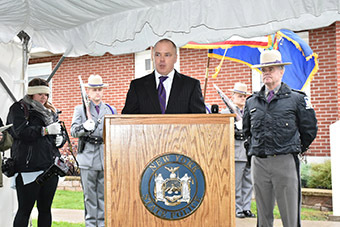 Michael C. Green, Executive Deputy Commissioner, speaks before presenting the Division of Criminal Justice Services’ Lifesaving Award to the family of New York State Trooper Joel R. Davis. 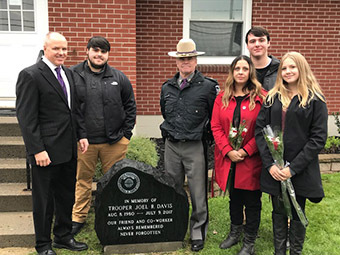 Commissioner Green and State Police Troop D Major Philip Rougeux are joined by Trooper Davis’ family – his wife, Suzanne, and their three children, Trenton, Caden and Jaila – after the award presentation and unveiling of a monument to honor Trooper Davis’ sacrifice and remember his service. Michael C. Green, Executive Deputy Commissioner of the Division of Criminal Justice Services, presented the 2017 Lifesaving Award to Trooper Davis' three children, who accepted the award on behalf of other family members in attendance: Trooper Davis' wife, his parents and brother. Following that presentation, members of the State Police who worked with Trooper Davis remembered their colleague and unveiled the memorial marker, which states, in part, "Our Friend and Co-Worker. Always Remembered. Never Forgotten." Trooper Davis, 36, spent his entire law enforcement career serving in Jefferson County. A four-year veteran of the State Police who also served with the Jefferson County Sheriff's Office, Trooper Davis was the first trooper killed in the line of duty in the North Country.